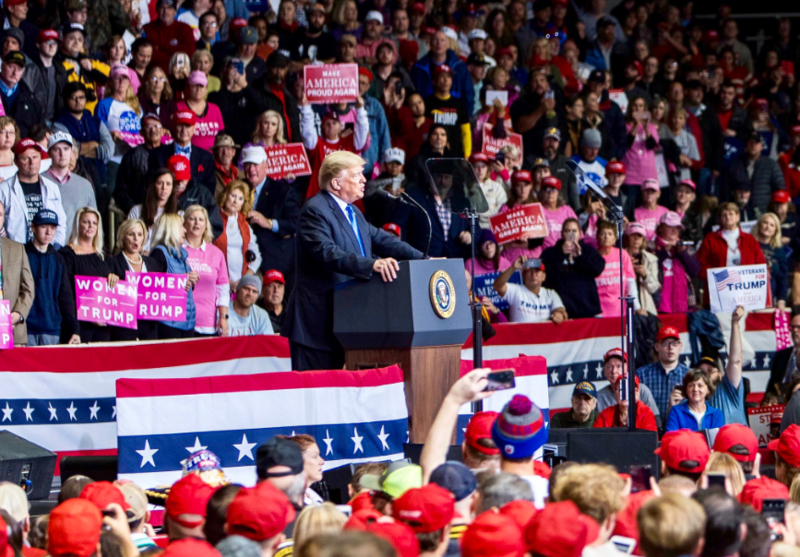 US President Donald Trump applauded his own his supporters as being “honest, principled people” during a rally in Charlotte, North Carolina Friday evening, whilst at the same time slamming the mainstream media for politicizing the actions of the Trump-obsessed man who sent a group of parcel bombs to Democratic politicians and known liberals earlier this week. Mr Cesar Sayoc Jr. now faces five charges including mailing explosives and threatening ex-presidents. So far fourteen devices have been discovered. The US President stated at a press conference before the rally that his acts were "despicable and have no place in our country". "I could really tone it up. Because, as you know, the media has been extremely unfair to me and to the Republican Party. This morning, the US mainstream media is reporting that Mr Sayoc is a registered Republican who attended several of Mr Trump's rallies in 2016 and 2017 and that he saw the US President, according to his lawyer, as a ‘father figure’. However, Mr Trump rejected any suggestion that his words would have contributed to sending of bombs. "I heard he was a person that preferred me over others. There's no blame, there's no anything," Mr Trump said.